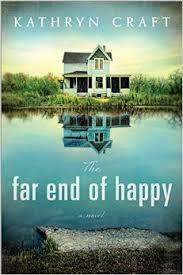 The Far End of Happy was sent to my by the publisher via Netgalley to read and give an honest review. Trigger warning: suicide, mental illness, depression. Twelve tense hours, three women, and the suicide standoff that turns one family’s little piece of heaven into a scene from hell. The story starts with the day that Ronnie’s husband is supposed to move out. But when Jeff pulls into the driveway drunk with a shotgun in the passenger seat, Ronnie realizes that nothing about that day will go as planned. We follow Ronnie, her two kids, mother and mother-in-law through the twelve intense hours of a suicide standoff. Slowly Ronnie recaps the way their marriage went to pieces and she tries to figure out just how Jeff could get so depressed that he would consider taking his own life. An emotional journey based on a true story. Kathryn Craft has done a really good job writing this story from different perspectives and giving the reader a unique insight to a very emotional and intense situation. I enjoyed her writing. The dialogues between the characters felt very real and emotional. The way she describes the surroundings and all of the events really does make this intense story come to life. Ronnie was a strong and likable character. I felt for her from the very beginning of the story and was rooting for her the whole way through. Her emotions and way of handling the situation felt very genuine. I was impressed by her strength! Janet (the mother-in-law) on the other hand, I wanted to slap sideways more than once. She was so quick with wanting to blame Ronnie for the whole situation. Trying to point the finger at everyone else instead of seeing her own problems and how they could have caused some of Jeff’s mental problems. A well made character that I loved to not love. And let’s not forget about the two young boys: Will and Andrew. Loved their innocence as well as their young wisdom! They were so cute and lovable. This book took me a little longer to get through than I expected and not because it wasn’t good, but because it was quite mentally draining to go through. My first though after finishing the last page was: Whoa! That was intense! There is no careful build up to where this story gets intense. It starts out that way and then you get the backstory little by little. I really liked that! The storyline was very different from anything that I’ve read before. It talks about mental illness in very nice way. You get to see the side of a dysfunctional marriage that you often hear about but could never really grasp. I was intrigued all the way through this emotional ride and I felt like it could not have ended any other way. An emotional, brutal and beautiful story about love, life and the prospect of death. About losing and finding oneself in situations that can seem hopeless. About finding faith in the darkest of moments if one looks for it in the right places. Above all, it is a story about family. The love and the hurt, and everything in between.